Awarding education funds for citizens who demonstrate character, drive, and service. I am Nathan. I am all in. Nathaniel Henry McDavitt (Nate or Nathan) was born in 1993 in Towson, MD, and was raised primarily in Glen Burnie and Severna Park, MD. Nathan left a lasting impression with those who knew him as someone who was “all in.” He played sports, participated in outdoor activities, served with the Boy Scouts, fed the homeless, and maintained F16s for the United States Air Force with unmatched energy and character. Nathan deployed on April 9, 2016, to the Middle East to support Operation Enduring Freedom. Operation Enduring Freedom is the official name used by the government of the United States to describe the global war on terrorism. On April 10, 2016, a severe wind storm collapsed the building he was working in. Nathan was transported to a hospital and succumbed to his injuries on April 15. Thanks to the Air Force and the Wounded Warrior Project, Nathan’s mother, father, and wife were able to be with him. Within 48 hours of his passing the Air Force brought Nathan home. At Dover Air Force Base, the Dignified Transfer ceremony was conducted with family present. Also there to honor Nathan were approximately 50 Airmen in formation, the Base Commander, and from the Pentagon, a General, Colonel and Chief Master Sergeant from Nathan’s career field. At his funeral on April 25, the USAF performed the honor guard service that no family wants to experience, but are deeply gratified and thankful once having been a part of it. The guards of honor were present; a United States flag was draped over the coffin; the firing of a volley shots saluted Nathan; and Taps commenced. From the distance, a chopper could be heard approaching. Low and just over the trees, a USAF chopper performed a fly by. Tears flowed again that day, as they had over the prior fifteen days. Nathan’s family has been consoled by the many stories that have been recounted about Nathan’s “all in” service and commitment to his country, community, family, friends, and fellow airmen. It has been amazing, and yet not really unexpected to hear the consistency in their stories. The common themes are “he always had a smile on his face,” “he was always willing to pitch in,” and “we have never met anyone quite like Nathan before.” Nathan has firmly established his legacy. Nathan started playing football and basketball as a youngster with the Crofton Cardinals and Indians, and the Severna Park Green Hornets. He played high school football for the Severna Park Fighting Falcons under Coach Hines. 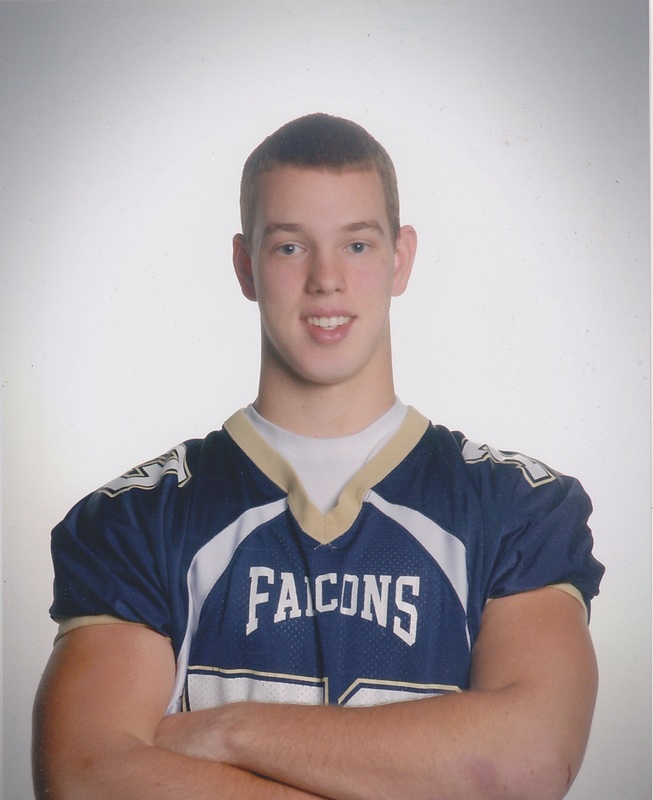 in 2010 the Severna Park Falcons awarded Nathan McDavitt the Buzz Purdy Award for “Essence of Character”. 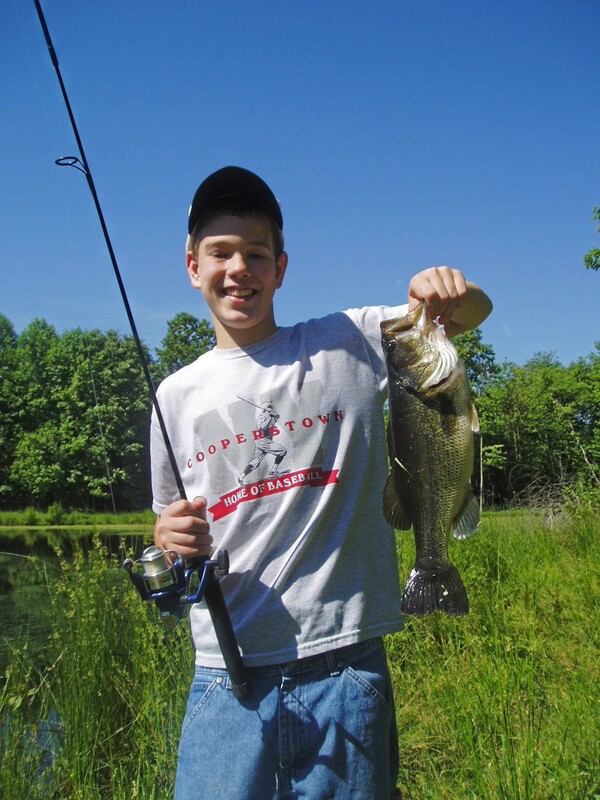 Nathan’s height sprouted early, but the weight didn’t catch up until his junior year when he managed to put on the pounds by eating up to 7 meals each day. Those tall, thin years presented serious challenges on the playing field, but Nate never gave up; he played “all in” no matter what. By his senior year, he was thriving on the football field and his ear-to-ear grin was a fixture at every game. Nathan joined the Cub Scouts at age seven. He started out as an eager-to-learn, yet shy young man and emerged as a leader looked up to by the younger Scouts and respected by the peers he was always willing to help. His Boy Scout career helped mold and develop a person who exemplified the character traits that define the Boy Scout Law. He demonstrated this character in the face of a family crisis—a house fire. When he was awakened in the night by flames, he alerted his family ensuring that everyone escaped the fire. 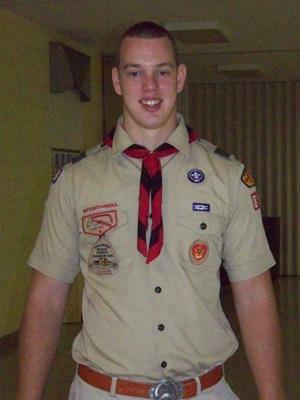 Recovering from this setback could have been an excuse to give up on the demands of pursuing his Eagle Scout community project, but instead the “all in” Nathan persevered and successfully completed the process, earning the highest rank of Eagle Scout in 2011. Nathan was an “all in” volunteer. 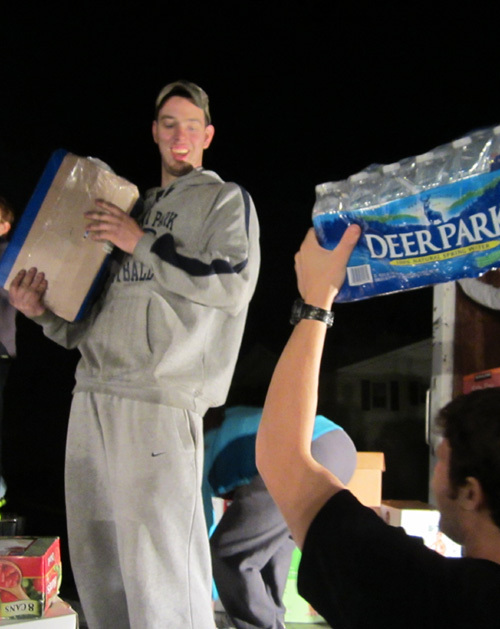 He participated in clothing and food drives, helped feed the homeless at shelters at Thanksgiving and Christmas Eve, and assisted with Hurricane Sandy relief. His involvement with local charity, Giving Back—Linda’s Legacy, the Boy Scouts, and St. Johns Church gave him ample opportunity to lead and serve among many other volunteers. He willingly shared his time to serve others with all the drive, determination, and enthusiasm that he displayed in every other endeavor he took on. Nathan committed to six years of “all in” service when he enlisted in the Air Force in 2014, and he knew exactly what he wanted—to be a Crew Chief responsible for maintaining fighter jets. Graduation from boot camp was celebrated with friends and family, and tech school followed. 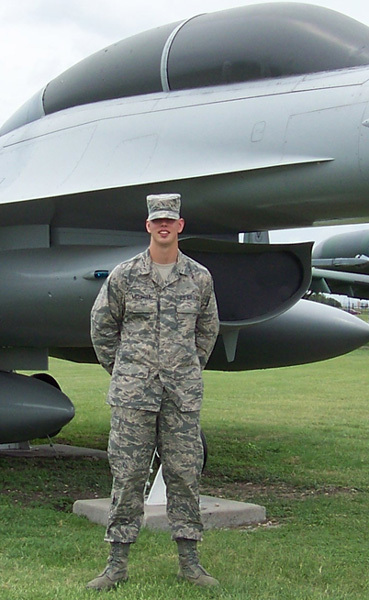 When Nathan finished tech school he became known as Airman 1st Class Nathaniel H. McDavitt, an F-16 Fighting Falcon tactical aircraft maintainer with the 52nd Equipment Maintenance Squadron. The USAF assigned Nathan to Spangdahlem Air Base in Germany with the 52nd Fighter Wing. The 52nd Equipment Maintenance Squadron’s mission is to “Provide fully mission capable aircraft through safe and professional maintenance.” Nathan thrived and was in his element. He was awarded “Airman of the Quarter” in December 2015. He met his future wife in the Air Force and they were married on December 30, 2015. 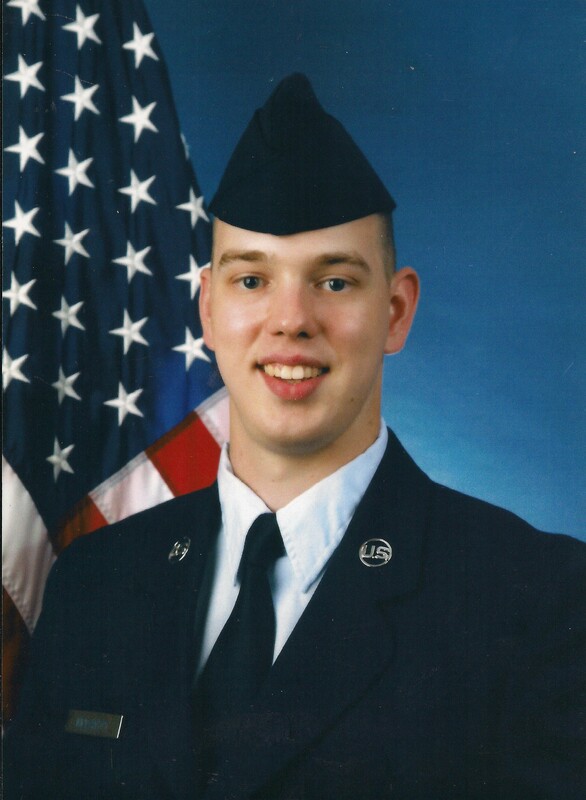 A1C Nathaniel H. McDavitt Memorial Scholarship Fund, Inc.